Raising from the ashes of a world bonfire of financially broken car brands, the latest Volvo product range appears to remain an individualistic brand restored to fighting fitness with Far Eastern financial underpinning. The reality of this news is, to me with memories of some never to be forgotten driving experiences in numerous iconic Volvo cars over many years, a more than welcome development that adds to car customer choice. 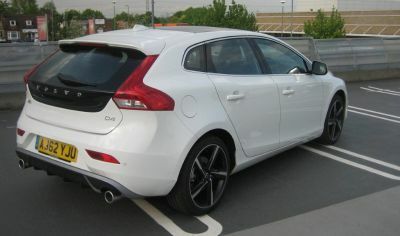 These thoughts went through my mind the first moment I set eyes on the latest Volvo V40 model, a mid-sized hatch back that visually cuts quite a dash with only a touch of traditional Volvo DNA around its nose and bonnet line, though under the skin the famous Volvo safety card is played very strongly. Primary inspection indicated that Volvo is clearly targeting the premium sector with this model, essentially, for want of a better term, the junior executive plus the well heeled who usually run more than one car. The base price is par for the class though the test car came loaded with a lot of extras to indicate what the buyer can achieve in creating the car of their choice – that hoisted the price by nearly another £6,000. There are five engines in the range, using two capacities – 1.6 and 2.0-litres and three using diesel the remainder petrol and all employing turbocharged induction. The test car features the second most potent power unit, a 5-cylinder diesel unit developing 175 bhp (3 bhp down on the top petrol model) and driving through a positive acting, logically ratioed 6-speed manual gearbox – an automatic transmission is also available. Invariably cars go as they look, this predominately sporty looking Volvo lived up to my expectations, creating an interesting engine note via its two large exhaust pipes and proving lustful on take off as the turbocharger delivered the power. Volvo claim a top speed of 137 mph and able to reach 60 mph from rest in 8.2 seconds though these claims are only part of the performance character, the immense flexibility of that straight 5 engine enables either lazy/easy progression through the speed scale without too much gear change effort or, actually quite a bit of dash if one feels so inclined. Official fuel consumption figures report a combined MPG of 65.7 mpg which, as usual, does not relate, in my opinion, to the real world and I would settle for a sensible consumption figure of around 50 mpg depending on how this car is driven/used and how much the automatic stop+start system is deployed. That should still give a re-fuelling range in the region of 600 miles. The car rides on a platform that employs a well honed fully independent suspension system, powerfully smooth all disc braking, plus the usual driver aides and responsive relatively light feeling steering, the latter undoubtedly one of the major contributors to providing a high degree of driver satisfaction. When it comes to seating comfort, particularly for the driver, Volvo has always prioritised both comfort and safety and I must admit I felt very safe and comfortable behind the wheel of the V 40. However, the lofty position of the driver’s seat means some taller drivers would have to tilt their head when accessing the seat as the roof line is a bit on the low side. Driver vision is very good front and side though rear view is restricted by the rear head rests – audible parking sensors and large exterior mirrors compensate. Interior styling, fascia presentation and standard of finish sets a very high standard and is far from ordinary. There is plenty of aluminium trim (including the pedals), the occupants sit on quality leather and the front seats are heated. This very well appointed car sets a good score for practicality, the seating is more than acceptable for five adults, the rear seats split fold, the average sized luggage area comes with a two position rear shelf and the oddments provision is handy, there are cup holders and, as usual, on a Volvo, a plastic clip on the windscreen for those non-adhesive pay and display parking tickets. Other significant features include auto fold exterior mirrors, an under bonnet airbag system that protects pedestrians and probably prevent a victim crashing through the windscreen. Add to that an easy-to-use satellite navigation system, proximity warning lights in the exterior mirrors, an audible parking system and the option of a spare wheel. Considering a quality class compact car with a bit of individuality? Then add the Volvo V40 range to your check list. Price from £27,495 – as tested: £33,320. 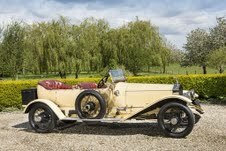 ROLLS-ROYCE: A 1913 Rolls-Royce silver ghost Tourer model, used as a mobile dental surgery in the World War I front line, is expected to sell for £600,000 at auction. It was originally owned by a French-American dentist who volunteered his services.